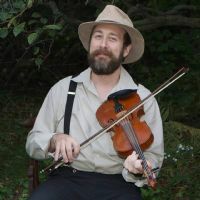 You must sign into your myHangout account in order to contact FiddlerPaul71. Well, March has come and gone. April is fast coming to its completion, and I find that I have not blogged lately. So many things going on, including learning so many more tunes for future installments of Old-Time TOTW. I dedicated my Old-Time TOTW series in the last four weeks of March to Women's History month. We started off with a popular tune, not by a woman source fiddler, but by featuring my fiddling friend Amanda Morrison playing The Eighth of January. Amanda is a great and fun fiddler in Akron, OH. She has been playing since she was a child, and I really enjoy getting together with her as often as I can to share tunes. On March 17, we featured an uncommon tune by Sarah Gray Armstrong (1883-1957) of Westmoreland County, PA. This was especially appropriate because Ms. Armstrong was born on March 18, 1883. The tune is found in Samuel Bayard's Hill Country Tunes published in 1944. It's a wonderful tune, and so much fun to play that I am surprised it is not heard more often. On March 24, we featured a tune called Uncle Henry, from Violet Hensley (1922- ) of Marion County, AR. Violet has made nearly 100 fiddles in her lifetime, and is known as the "Whittlin' Fiddler of Yellville." She will turn 103 on October 21. I really wish I could go to AR and meet her. She learned to play on the violin, and, usually, on the first day of the week, sailed forth with her instrument, in order to draw persons of both sexes together, who, not having the fear of God before their eyes, delighted like herself, in sinful and pernicious amusement…"
In her Fiddle Book, Marion Thede made short mention of women fiddlers, but it was not a very flattering description. Freaks! What woman would even want to play the fiddle with that kind of association? Marion, of course, was a woman fiddler, but did she associate herself with those women, seeing that she learned classical violin and crossed over to fiddle music later in life? Thede includes no tunes from women fiddlers in her book, but she does show some photos of women fiddlers. Was this merely because there were none in the areas where she collected tunes? “It was unusual for a woman to pay the fiddle at that time [c. 1920s-30s], and [Hensley] knew of no other women fiddlers in her neighborhood. That did not deter her, and she was often seen playing at square dances with her father." I recently found a copy of Bolick's Mississippi Fiddle Tunes and Songs from the 1930s at my local library, and there appears to be many transcriptions there from women. I need to give it a good go-over. All I can say is that I'm certainly glad that times have changed where women fiddlers are no longer looked at as being queer or freaks. There are many wonderful modern fiddlers who are playing and passing along tunes. To each one of them, I give my sincere appreciation and gratitude.